Notice To Appear, is a must see video from the producers of the legendary TB Series, Standard Films. 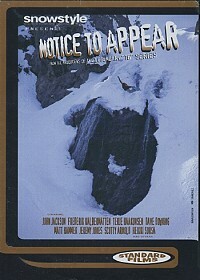 Shot on 16mm & super 8 film, Notice To Appear will bring you closer to the feel of snowboarding than ever before. Witness, the most progressive free-ride & freestyle snowboarding to date. Check out the largest kickers in Norway, inner city rails, super size half-pipes, ridiculous large cliff drops, and mental descents in Alaska, Lake Tahoe & New Zealand. Ride with the best snowboarders in the world hand selected by Standard Films. Discover which new, young, shredders will become tomorrows wanted stars. Notice to Appear.